Ruth Hallows wears her winning ‘Celestial’ wedding and engagement ring set. Ruth Hallows, a mature student currently studying for a Higher National Diploma in Jewellery and Silversmithing at the School of Jewellery (BCU) has won an annual design competition for students organised by the Birmingham-based casting house, 3D printing and bespoke manufacturing company Weston Beamor. Her win was announced by Patrick Fuller, chairman of Weston Beamor, on the company’s stand at the Jewellery & Watch Show Birmingham. Presenting Hallows with her prize (a cheque for £500 and a week of work experience with Weston Beamor) Fuller said that he felt this year’s designs, which were for a halo engagement ring and a fitted wedding band to sit alongside it, had been particularly strong and congratulated, not simply Hallow but all those who had taken part in the competition. “There were some wonderful designs with real excitement and energy,” he said. Fuller had particular praise for Hallows’ ‘Celestial’ rings in platinum and yellow gold, which he said were ‘very unusual and innovative’. The rings were inspired by the night sky, stars and constellations. Hallows, whose comes from Darlington and who previously worked in graphic design and retailing before turning her hand to jewellery, is no stranger to success having won a prize during her first year at BCU to have one of her designs manufactured and sold by Argos. She says that her dream, having first achieved a BA degree, is to establish her own jewellery collection. The runners up in the competition were Bethany Ross, who came second and Sarah Shiau who was third. They win £250 and £100 respectively and receive a week of work experience at Weston Beamor. 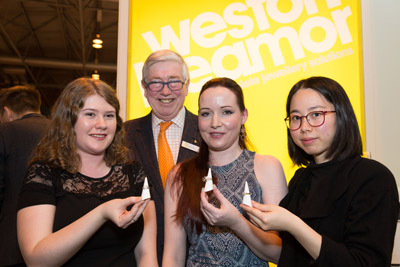 Speaking on behalf of the School of Jewellery, Course Director, Jo Pond, said she would like to thank Glen Day, Ed Hole and Anousca Hume from Weston Beamor who were closely involved with the competition and in bringing the winners’ ring designs to reality. 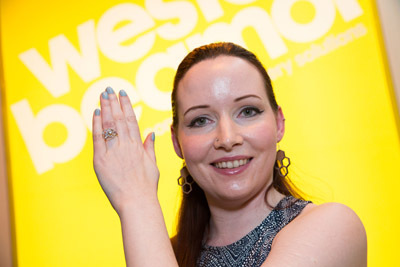 “We very much value our links with Weston Beamor and know that our students learn a great deal about how a large, commercial jewellery business operates,” she said.